Yesterday, Easter Saturday, I got to see the Royal Opera House production of Wagner’s Parsifal. It was broadcast live to many locations of December 18th last year but hasn’t been seen in Toronto until now. It was very much a three act experience. At the end of the first and longest act I thought we were perhaps seeing greatness in the making. Stephen Langridge’s production concept supported by Alison Chitty’s fairly abstract modern designs were making all kinds of sense to me. 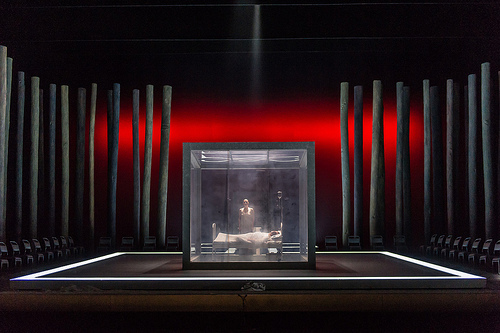 At centre stage is a white, semi transparent cube serving as both grail shrine and Amfortas’ hospital room. Within it, various aspects of the back story are shown to us and it comes off as a place of knowledge; perhaps of a much deeper kind than has yet been revealed. This impression is reinforced with the unveiling of the Grail late in the act. It is a young, Christ like boy. The grail ceremony involves Amfortas cutting him to release the blood for the ceremony. There’s a lot of blood letting but it makes sense. We are seeing a very wounded and dysfunctional polity.